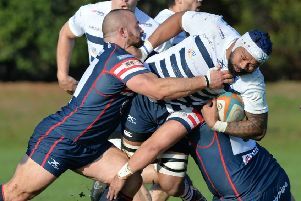 The Midlands outfit were 22-7 ahead after making a terrific start, but Ionians shored up their defence and hit back to secure promotion to National One. After the Lions had scored in the opening minute, wing forward Stuart Newman touched down for the Yorkshire side, centre Lewis Minikin converting. But Leicester continued to threaten with three more tries coming to give Ionians cause for concern as they trailed 22-7. However, second row Joe Makin scored on 25 minutes and Newman added his second, Minikin converting one and adding a penalty to level at 22-22. After the break Hull extended their lead with centre James Tincknell scoring twice and Minikin touching down himself as well as converting three of their four second-half tries, just missing out on improving No 8 Mark Wigham’s 69th-minute try which had put them 48-25 ahead. The win means Ionians cannot be caught by second-placed Chester, who will go to the play-offs after a 31-0 win over Otley. Huddersfield’s slim hopes of pipping Chester to the play-off spot were dashed as they could only manage a 17-12 win at Wharfedale, missing out on a four-try bonus point. But the second half was a closely-fought affair, the only other score being another try from Bullough on 72 minutes which gave Wharfedale a losing bonus point. The lead changed hands six times in an action-packed match between Hinckley and Sheffield Tigers, but the Yorkshire side lost out 37-34 and had to settle for two bonus points instead of a win. Centre Jamie Broadley and winger Henri Packard scored tries for Tigers in the first half and Mark Ireland converted both and added a penalty, but they still trailed 22-17 at the break with the Midlands side having scored three tries. Tigers hit back to lead 31-22 with centre Tom Hart touching down while Broadley bagged his second, Ireland converting both before trading penalties with his opposite number to leave the match at 25-34 with half an hour left to play. But the hosts shored up their defence and ran in two more tries to secure the win. Promotion-chasing Blackheath beat Rotherham Titans 28-7 as the Yorkshire side’s first season back in National One continued to stutter. Tries from stand-off Mark Cooke, full-back Leo Fielding and flanker Steve Leonard ensured the London side were 21-0 ahead at half-time, and they extended that lead with Ben Ransom scoring with five minutes left, Fielding adding all four conversions. Henry Roberts touched down for Rotherham with three minutes left and Connor Dever converted, but it was just a consolation for Rotherham Titans. Harrogate’s hopes of scraping into the North Premier League play-offs were dashed as they could only beat Sandal 24-13, missing out on a four-try bonus point as their rivals for a play-off spot, Blaydon romped to an 87-15 victory at second-bottom Vale of Lune to secure second spot. In North One East, Scarborough will go to Blackburn in the play-offs as they aim to take the third promotion spot into the North Premier league. Scarborough were 39-26 victors over visiting Bradford & Bingley, while at the other end of the table Cleckheaton ensured they finish fourth bottom and survive thanks to a 49-26 win over Malton and Norton. In Yorkshire One, champions Moortown suffered a shock 30-24 defeat to second-bottom Old Rishworthians. Goole needed to win to secure the Yorkshire Two title and deny Leodiensians, and this they did in convincing fashion, defeating bottom club Old Otliensians 69-12. Wensleydale completed their promotion-winning season from Yorkshire Three with a 29-5 win at Rotherham Phoenix.